This entry was posted in Art culture, condescending, controversial, extremely condescending, extremely controversial, extremely personal, health, Personal, Philosophy, Politics, very condescending on April 19, 2016 by admin. [over encryptie] Allereerst zolang er geen nood is moet men niets doen. Want ik zie niet meteen een echte noodzaak om alle mensen hun elektronica te kunnen kraken. Dat was vroeger niet nodig; vandaag zijn er niet meer of minder gevaarlijke gekken en elektronica voegt maar weinig toe aan hun wapenarsenaal. Dus is dat nu niet nodig. Niet gestresseerd geraken. Zoals alle mensen presteer je slecht wanneer je gestresseerd bent. Hold the line. Molenbeek en Vorst was trouwens prachtig werk. Goed gedaan. We vinden die balans wel. This entry was posted in controversial, extremely controversial, extremely personal, health, Personal, Philosophy, Politics, Uncategorized on March 25, 2016 by admin. A year or so after my PADI rescue, my diving club has convinced me to wake up about twelve times early in the morning on Saturday, to get me trained to become a PADI master diver. 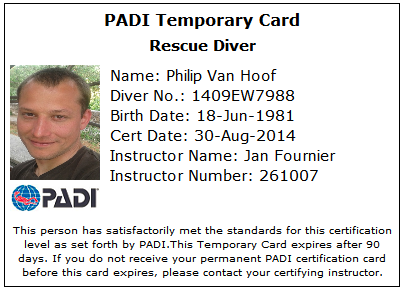 The jokers in my club told me it’s not so hard as PADI Rescue training. The only hard part is Saturday morning. We’ll see, I wonder. heh. Oh, and to our security services: well done catching those guys from Molenbeek and Vorst. Good job! Oh, I got invited to NLGG to talk about Tracker in Utrecht tomorrow. This entry was posted in Art culture, condescending, controversial, english, extremely condescending, extremely controversial, extremely personal, health, Personal, Philosophy, very condescending on March 18, 2016 by admin. Have you guys stopped debating systemd like a bunch of morons already? Because I’ve been keeping myself away from the debate a bit: the amount of idiot was just too large for my mind.People who know me also know that quite a bit of idiot fits into it. I remember when I was younger, somewhere in the beginning of the century, that we first debated ORBit-2, then Bonobo, then software foolishly written with it like Evolution, Mono (and the idea of rewriting Evolution in C#. But first we needed a development environment MonoDevelop to write it in – oh the gnomes). XFree86 and then the X.Org fork. Then Scaffolding and Anjuta. Beagle and Tracker (oh the gnomes). Rhythmbox versus Banshee (oh the gnomes). Desktop settings in gconf, then all sorts of gnome services, then having a shared mainloop implementation with Qt. Then god knows what. Dconf, udev, gio, hal, FS monitoring: a lot of things that were silently but actually often bigger impact changes than systemd is because much much more real code had to be rewritten, not just badly written init.d-scripts. The Linux eco-system has reinvented itself several times without most people having noticed it. Then finally D-Bus came. And yes, evil Lennart was there too. He was also one of those young guys working on stuff. I think evil evil pulseaudio by that time (thank god Lennart replaced the old utter crap we had with it). You know, working on stuff. D-Bus’s debate began a bit like systemd’s debate: Everybody had feelings about their own IPC system being better because of this and that (most of which where really bad copies of xmms’s remote control infrastructure). It turned out that KDE got it mostly right with DCOP, so D-Bus copied a lot from it. It also opened a lot of IPC author’s eyes that message based IPC, uniform activation of services, introspection and a uniform way of defining the interface are all goddamned important things. Also other things, like tools for monitoring and debugging plus libraries for all goddamn popular programming environments and most importantly for IPC their mainloops, appeared to be really important. The uniformity between Qt/KDE and Gtk+/GNOME application’s IPC systems was quite a nice thing and a real enabler: suddenly the two worlds’ softwares could talk with each other. Without it, Tracker could not have happened on the N900 and N9. Or how do you think qt/qsparql talks with it? Nowadays everybody who isn’t insane or has a really, really, really good reason (like awesome latency or something, although kdbus solves that too), and with exception of all Belgian Linux programmers (who for inexplicable reasons all want their own personal IPC – and then endlessly work on bridges to all other Belgian Linux programmer’s IPC systems), won’t write his own IPC system. They’ll just use D-Bus and get it over with (or they initially bridge to D-Bus, and refactor their own code away over time). The D-Bus debate was among software developers. And sometimes teh morons joined. But they didn’t understand what the heck we where doing. It was easy to just keep the debate mostly technical. Besides, we had some (for them) really difficult to understand stuff to reply like “you have file descriptor passing for that”, “study it and come back”. Those who came back are now all expert D-Bus users (I btw think and/or remember that evil Lennart worked on FD passing in D-Bus). Good times. Lot’s of debates. But the systemd debate, not the software, the debate, is only moron. Recently I’ve seen some people actually looking into it and learning it. And then reporting about what they learned. That’s not really moron of course. But then their blogs get morons in the comments. Morons all over the place. Why aren’t they on their fantastic *BSD or Devuan or something already? ps. Lennart, if you read this (I don’t think so): I don’t think you are evil. You’re super nice and fluffy. Thanks for all the fish! This entry was posted in Art culture, condescending, controversial, english, extremely condescending, extremely controversial, extremely personal, health, Informatics and programming, Personal, Philosophy, Politics, Uncategorized, very condescending on May 1, 2015 by admin. It’s not the despair, Laura. This entry was posted in Art culture, condescending, controversial, english, extremely condescending, extremely controversial, extremely personal, health, Informatics and programming, Personal, Philosophy, Politics, Science, Uncategorized, very condescending on March 28, 2015 by admin. I, myself, actually would not be able to live with not having made this attempt – Angela Merkel. This entry was posted in Art culture, controversial, english, health, Personal, Philosophy, Politics on February 11, 2015 by admin. Want daarin staat precies vermeld, hoe het met de dieren is gesteld. This entry was posted in Art culture, condescending, controversial, health, Personal, Philosophy, Politics, Uncategorized, very condescending on October 18, 2014 by admin. For this one I worked really hard. Buddy breading, relaxing people in panic at 20 meters deep, keeping yourself cool. And that in Belgian waters (no visibility and freezing cold). We simulated it all. It was harder than most other things I did in my life. This entry was posted in Art culture, controversial, english, health, Personal, Philosophy, Politics, Science, Uncategorized on September 1, 2014 by admin. Surprisingly I’m in agreement with what Richard has to say in this specific context. This entry was posted in Art culture, controversial, english, extremely controversial, health, Informatics and programming, Personal, Philosophy, Politics on July 26, 2013 by admin.